a Swedish sea-level scientist whether he was concerned about global warming causing the inundation of Bangladesh. Professor Nils-Axel Morner explained that Bangladesh is actually sinking but it’s delta-land is replenished annually by river silt. John Vidal got a Bronze Medal for asking his question. The United Kingdom’s first Gold was, as expected, won by Professor Phil Jones for services to Climate Scepticism, and a Silver for “the Trick”. Another Gold was snatched by the UK team when the British Meteorological Institute announced at Copenhagen that the last decade was the hottest on record, then announced that an investigation into the past 160 years of their temperature records, would be undertaken. This investigation would take three years, they said. China won a Gold Medal in the “Take Away” event when it demanded that most of the “developing country” money for CO2 abatement go to China. The United States picked up the “You’ve got be Joking” Gold Medal, immediately after China’s win. China then got Silver for its swipe at the United States spokesman Todd Stern, suggesting that Stern “lacked common sense”. The main US/China bout will take place next week. The United Nations won two Gold Medals when its IPCC team won the “Fund Raiser” event with its world-wide $50 billion “Climate-Change Research Program” and the “Best of Show” for the Copenhagen COP15 presentation. It also won a Bronze Medal for the Climate Catastrophe Video presented on the opening day. 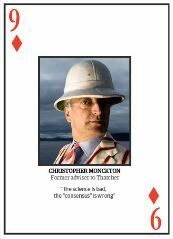 In the much watched “Forget the Science— Go for Spin 100 metres Dash”, the Gold went to George Monbiot with his deck of playing cards, each card depicting a “top climate change denier”. This medal was expected to be a tight race between Monbiot, Al Gore and our own Tim Flannery, but there has been no sign of Gore or Flannery. Insiders at the COP15 expect that they are holding their fire until next week when the climate celebrities arrive. The Ukraine won a Gold Medal and a Feather Boa for its announcement that it had set its emissions target for a +75% increase in their CO2 output. Barak Obama took out the Gold Medal for the “Keep Democracy Alive Marathon” when his environment office announced at Copenhagen that the US EPA had declared CO2 a health hazard, thereby empowering Obama to bypass the US Congress and Senate and take action via the US bureaucracy. The European Union, China and the G77 couldn’t see what the problem was in that. In the “A Star is Born” event the Gold Medal went to Sudan’s Lumumba Stanislas Dia Ping who became an instant celebrity at Copenhagen, representing the G77 nations of which there is 130 members. Lumumba lives in New York, and while constantly attacking the evil West, and running the “Climate Justice Now” campaign, has yet to mention Darfur. Meanwhile, from the Alternate Climate Games, run privately by the Danish prime minister, details were leaked about the “secret draft Copenhagen Agreement” which had our Prime Minister Rudd’s fingerprints all over the package. Drawn up by the Danish PM and his “Friends of the Chair”, the agreement planned to pre-empt any decision made by the 33,000 delegates. Most of these delegates, nearly all of whom have had very little experience of Kevin Rudd, were extremely miffed. Bronze. All eyes are now turned towards next week when the main climate-athletes arrive with their delegations. Australia’s 114 member team is expected to be awarded the Gold Medal for size-over-distance breaststroke with a 15.94 tonnes of carbon per member in their kit. As one mathematician has calculated, the Copenhagen COP15 event will create more carbon in two weeks, than all the carbon saved by all the Toyota Prius cars since they hit the road in 1997. How’s the weather down your way?